I noticed that a lot of you were looking for reviews of the Tony Hawk Ride . I loved it, my kids loved it and I predict that it will be impossible to find right before X-Mas. Right now I’m giving away a X-Mas Tree. What good is a Christmas Tree without a gift to put under it? Tony Hawk has a fantastic Gaming peripheral that’s just come on the market. The Tony Hawk Ride behaves like a skateboard would attached to your gaming system. Activision kindly let me and the kids have a preview of The Ride, and we loved it. In fact, I loved it so much I asked them if I could have one for a friend. “Tony Hawk is a really nice guy, you said so yourself.” Activision sounded worried. “Tony is not sharing, he is hogging the game!” I cried. So the blackmail didn’t work, but the nagging did and I have one extra game for one lucky reader in the US. My review of The Ride is here. Entering this contest is simple, just leave a comment below telling me which gaming console you use: wii, xbox or playstation. Make sure you use a valid email address. Each comment counts as one entry. Pingbacks will also count as an entry, so a link to the contest on your blog could enter you a second time. Entries close at midnight November 24th Pacific Time. Sometime Wednesday morning I’ll call my Brother, who knows none of you, and ask him to pick a number between 1 and [however many entries there are]. That person will be contacted. If you don’t respond within 24 hours, we’ll pick another winner. Please note, the blackmail is fictional, but the nagging is not. The folks over at Activision take a ton of crap from me, and I really do want to thank them for being so generous to my readers. Wii! That would be so great! I loved the Tony Hawk review. We have a Wii and an XBOX 360, but would love this for the Wii. THANKS for the giveaway!! Can I add… “pick me, pick me!!!!”???? I just heard Tony hawk on wait wait don’t tell me, I totally believe he’s mean to kids :). I’ve got a wii and two skateboard loving kids. Wii and winning it would help secure my title for another year of “World’s Best Aunt”!! We have a Wii and I would love to win this! We have a WII! Thanks for the chance to win. Thank you so much for offering to giveaway and to Activison too! My sons would flip over this game. I’d love the wii game if we won. Thanks. Wii. My 12 yo daughter wants this really bad. I would use my Xbox 360 to play with my boyfriend! Wii – have 3 kids and a hubby who would love this! We use a Wii and matthew would love to have one of those! Wii have a lot of fun at our house. My 3 boys would love this game. They think they are shredders! That is skater talk, right? Wii- My guys would love this. We have a Wii and a few kids that would love it here. I would be the world’s best stepmom if I could score this game for my stepson to play on our Wii! We have a Wii. Thanks Jessica! Jess! Just wanted to tell you how amusing your post was. You clever girl. Not really entering the contest. Unless I win. Then, of course, this is an official entry. Right? Wii. I’d promise to put it under the menorah, but then there’s that whole concern about waxy build up and thing catching fire. Wii appreciate the opportunity to give our grandson one less reason to be embarassed by us. I have a Wii system. My son would love that game!! wii would love this for the wii!! We have a PS3 and a WII. Would love either format. I have a Wii and Tony Hawk Rules. we also have a wii, this game looks amazing! I will use the Tony Hawk Ride game on the Wii. we use wii and x-box! leave tony alone, he’s not hogging he’s teaching silly! Wii This looks like a great game! I have a Wii. Our family loves this gaming console. I love my Wii so I’d use this board for it. We have a Wii, Xbox 360 and PS3. Thanks for the chance. My family has a Wii and my hubby loves him some Tony Hawk. I like your review and I think you were right ha ha I don’t have a console but if I win I’ll buy one for sure! My kids would love to have this for the wii! My son has a Wii. Thank you! Tony Hawk is the man. WouldLove Tony Haek for our Wii. Wii please, my son would love this! My family and I use Wii!!! My son has a wii….and I have hope. C’mon Santa! my brother has a wii. 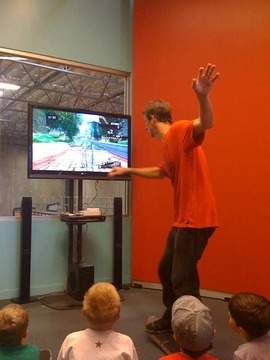 I’d like Tony Hawk for the Wii please. We’re a Wii household. Thank you for the chance to win. My older nephew (and no doubt the rest of the family) will love this game. XBOX and a Wii, thanks! wii but only have a few games, need more! XBOX Oldskool style planning a 360 from another site. we use the Wii and LOVE it!! We have a playstation. Thanks a bunch the game looks cool. We have a Wii console. Thanks for the chance to win! We have a Nintendo Wii that we love and play often. Awesome, awesome, thanks for the Tony Hawk story! My son has wanted this since it was released, we’d want it for the Nintendo Wii :D We love Tony!!! We have a wii and a playstation3. Wi console for the family for Christmas, this would be a great start to a gaming library for it! I would love, love this for the wii for my son. He has been wanting this. Xbox 360, if not- I just see Xbox. I’ll take the Wii for my sister. We rock the BOX…..The XBOX, that is. My son would love to hop on that board. I’m not sure if he will know exactly what he is doing but BOY WILL HE LOOK COOL! Xbox 360 or the Wii. Tony Hawk is the best!!! I’d love this for the Wii. We use the x-Box system and I would LOVE to win this! ps3 version would be great! My son has XBOX and would LOVE this!! Thanks so much! I just donated my Wii to my parents because I don’t have the time to use it much any more and they babysit for lots and lots of kids who would get so much more use out of it. I’d love to be able to give them this new game for the kids to play too, it looks like it would be alot of fun. I would choose it for the Wii, it is the only system we have and we only have 3 games, so the kids would love this! We have a Wii. My son loves Tony Hawk and this is on his Chrismtas wish list. We have a Playstation 3. My husband and son would LOVE this game! We have a Wii and love Mario Party. We are a Wii family and enjoy our games very much! Cool!!!!!!!!! My daughter will scream!!!!!!!! Wii game system. My son really really wants this!! I got my kids the Nintendo Wii, they love it! Thank for the chance! We would love this for the Wii!! My children are getting a Wii for Christmas and they would be thrilled to own this!! xbox LOL looks like i could hurt myself on it even though theres no wheels good thing my son would get it if your brother picks a big number. Thanks for the chance! I want this sooo bad on PS3, but I just had a baby! My wife won’t let me spend money on any new PS3 games. I especially want this because I skated back in the 80s, but don’t have the stamina anymore! This would be like old times! I’d love this for the Wii. Thanks! I just got the Wii for my kids for X-mas! Thanks for this opportunity to win this epic game! I would like this game for the Wii. My son has a Wii and he would love, love, love this game! I would choose the Wii. We have all three, but my second-to-oldest (the skateboard fanatic) uses the PS3 the most, so he would probably prefer it for that console. Thank you. Wii!!! What a great game! Thanks for the chance! We have a wii and are giving the kids a ps3 this christmas. Thanks. We use the wii, thanks so much! This is kind of a goofy answer, but myself and my two best friends have all three major systems. I have a Wii, Isaac has a PS3, and John has a 360. My family uses the Xbox 360. Thanks so much for nagging Activision for our sake! We play on the Wii console. Wii please. This game looks so awesome!! My kids would just LOVE it!! I’d like this game for the Wii. Thanks to you and Activision for the chance to win this! Xbox is what we have. My kids have a playstation. We use a wii.. I would love to get a P3, but our current system is a wii. We have Wii…and I know my two would love this! Since I have various members of the family with either a Wii, an XBOX 360, or a PS3, it is hard to decide. I guess I’d like a PS3 version. One Christmas gift down, dozens more to go. My son is 13 and loves Tony Hawk. He has your shirts and would love your skateboard game for his Wii console! First off, Thank you Jessica (for your Nagging that resulted in this AWESOME giveaway, lol! Much appreciated!) and Activision for providing the goods! My family would LOVE to have this sweet game for the XBOX 360, I think it would be so much fun watching my 17 y/o Son show off, my Husband “attempting” to re-creat Tony Hawks mad skills, my 4 y/o Daughter showing them who the REAL Gamer in the house is, and finally me… it will be especially priceless to them when I fall on my behind while attempting to step on the board! This game would make an ‘awesome’ Christmas Stocking Stuffer for my son; who’s Tony Hawk’s ‘BIGGEST FAN’! We use the Nintendo Wii (and love it!). I would love to win this for my son. We have the wii and the 360, so we’d have a blast on either! My son has the Wii and loves Tony Hawk so i would like one for the wii and it will be a great christmas gift. Tony Hawk: I would like it on the PS3. Wow, so many people have Wiis. I do too but the PS3 has a comeback as the best console out now. We would love one for the Wii! Looks like a super fun game! Playstation 3 ..my son would love this! We have an Xbox and I’d love to have this to put under the tree for my son. We mostly use the Wii, since it’s in the living room. WII, I HOPE I CAN WIN THIS!!! Playstation 3 … We both are Gottliebs!! This looks sick. i want it for 360.